There’s hardly a Thai-inspired dish I don’t love. I’d seen a number of recipes for Thai noodle soup online, but most of them contained coconut milk (high in saturated fat), oil, and sugar. I had to figure out how to eliminate those without sacrificing taste and texture. Here is the result—a mouth-watering peanut-infused soup with noodles. 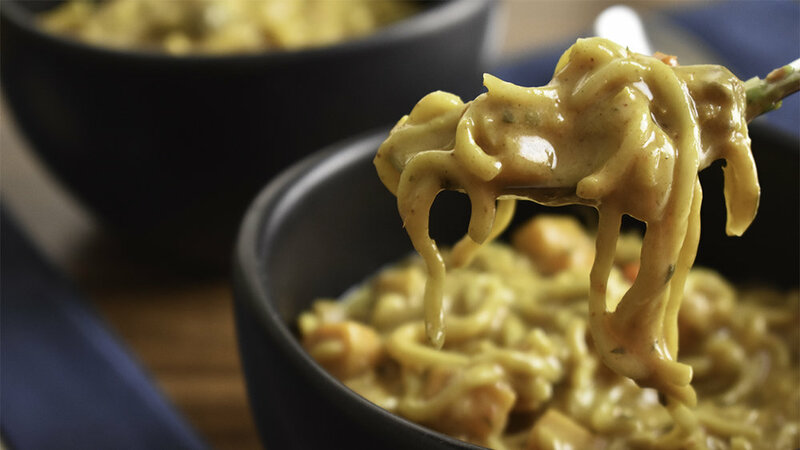 It’s creamy and savory, but with hints of lime and curry paste to jazz things up. Start soaking the cashews and dates for the cashew broth, if needed. Water-sauté the vegetables (start with 1/4 cup water) for 8 to 10 minutes, until the sweet potato pieces are soft. Cashew broth. Create cashew broth for the soup by blending the following ingredients on high for 30 seconds or longer, until the cashews and dates are dissolved. (If you do not have a high speed blender, soak the cashews first for 2 hours, or pour boiling water over them and soak them for 20 minutes; drain.) Set the broth aside. Back to the sweet potatoes and red peppers: add the following ingredients to pot, stir them in, and cook for another few minutes. Increase heat to medium-high, add the following ingredients, stir, and cook, uncovered, for about 5 minutes, until the thickness is to your liking. Add the following ingredients and cook for 3 minutes. To serve, ladle soup into bowls, and divide the garnishes among the bowls. This comforting soup requires more spices than others, but it’s totally worth it. This tasty, substantial soup can serve as an entrée in its own right. Freezes well. Instant Pot instructions at bottom. Create cashew milk for the soup by blending the cashews and water together on high for 30 seconds or longer, until the cashews are dissolved. (If you do not have a high speed blender, soak the cashews first for 2 hours, or pour boiling water over them and soak them for 20 minutes; drain.) Set aside. Add the following ingredients to a Dutch oven or soup pot, bring to a boil, cook for about an hour, partly covered, until the split peas are very tender. Add the following and stir for a few minutes until the greens are wilted and the thickness of the soup is to your liking. For the Instant Pot: Put the main list of ingredients in the Instant Pot. This is the ultimate healthy soup. The lentils add critical substance, while the cumin, coriander, mint, cilantro, and jalapeño contribute incredible flavor. You may be surprised how addictive this soup is. It’s an intense green color as well. Put the following ingredients in a large (at least 6-quart) Dutch oven. Bring to a boil, then turn down the heat and simmer, covered, for about 25 minutes, until the lentils are tender. Then stir the following ingredients into the pot. Cover and cook 5 minutes more. Finally, stir in the following ingredients. Return to a simmer, cover and cook until the spinach is tender but still bright green, about 5 minutes more. Stir in lemon juice. Use a stick (immersion) blender to make a smooth soup. Taste and add more lemon juice, salt, and/or pepper. 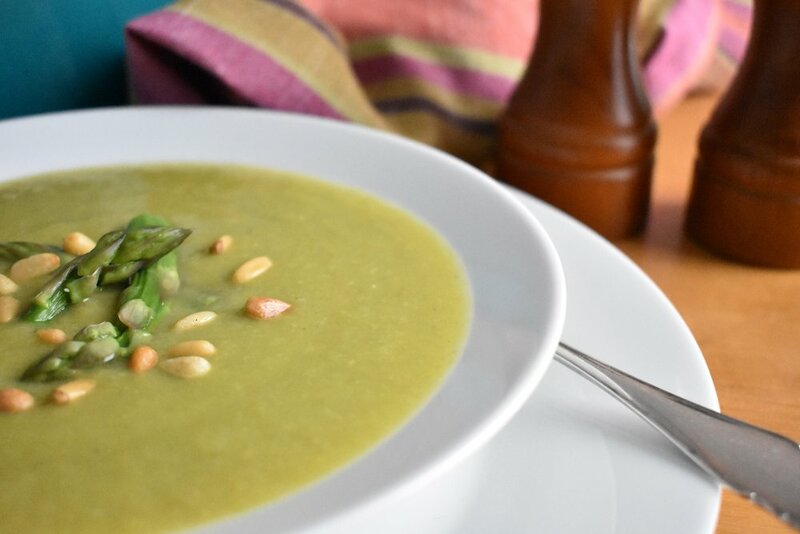 * For a variation, you can use green French lentils (Lentilles du Puy) and keep the soup chunky and unblended. They have thicker skins and need about 15 more minutes cooking time. Turkish red lentil soup is a great soup for your regular rotation. It’s quick, cheap, and filling. It works well any time of year and is perfect for when you’re feeling under the weather. You can keep it simple or dress it up with lots of toppings. Put all ingredients in a Dutch oven or soup pot, bring to a boil, and simmer, covered, 30 minutes, until the rice is cooked and the lentils have virtually dissolved into a puree. Add salt to taste. Add a little water if it’s too thick. * Some stores, like Trader Joe’s, offer pre-cooked frozen brown rice in the frozen foods aisle. This is based on a Madhur Jaffrey recipe, but I’ve adapted it quite a bit, notably eliminating the coconut milk and streamlining the method. It takes some ingredient-hunting and a bit of time, but it’s so worth it. Curry leaves do freeze well, so once you buy a batch at an Asian market, you will have enough for many batches. Combine the stock mixture, spices, and all of these in a Dutch oven or soup pot and bring to a boil. Cover, turn the heat down, and simmer for about 50 minutes, until all the vegetables are tender. Separately, add the following ingredients to a small frying pan on medium heat. Stir and roast until they are a shade darker and fragrant. Cool them for 15-20 minutes, then grind them up in a clean coffee grinder. Then add them to the cooking soup. Meanwhile, create cashew milk for the soup by blending the water, cashews and chickpea flour together on high for 30 seconds or longer, until the cashews are dissolved. (If you do not have a high speed blender, soak the cashews for 2 hours, or pour boiling water over them and soak them for 20 minutes; drain.) Set aside. Put it all together. Add the following ingredients to the soup once the vegetables are tender. Use a hand blender to puree the mixture. Simmer gently for 2-3 minutes to blend the flavors. Thin out with more stock if needed. This divine chowder is perfect for a fall or winter meal, even part of a holiday dinner. It’s substantial, with hints of thyme, onion, celery, and umami. The corn and carrots add specks of color. This chowder could become your go-to potato soup recipe. Add the following ingredients to a large soup pot or Dutch oven. Bring to a boil, reduce the heat, and simmer, covered, until the potatoes are tender, 15 to 20 minutes. While the soup is cooking, complete the cashew cream by draining the cashews and rinsing them under cold water. Then place them in a blender with enough fresh cold water to barely cover them. Blend on high for several minutes until very smooth, so smooth that you can no longer detect any bits of cashews. After the potatoes are soft, mash some of them in the soup pot with a potato masher and stir to thicken the soup. Add the following ingredients and simmer for 4-5 minutes, stirring often, because the cashew cream can burn on the bottom of the pot. Remove the thyme twigs. Garnish each bowl, if desired, with chives and diced tomato. Substituting creamed cashews, water, and coconut extract for coconut milk really saves on saturated fat. A quarter-cup of coconut milk has 11 grams of saturated fat, as much as a Burger King Whopper. In this soup, the sweet potatoes, lentils, spices, vegetables, and coconut milk substitutes make for irresistible texture and taste. No sacrifice here. Create cashew milk for the soup by blending the cashews and water together on high for 30 seconds or longer, until the cashews are dissolved. (If you do not have a high speed blender, soak the cashews for 2 hours, or pour boiling water over them and soak them for 20 minutes; drain.) Set aside. Combine the following ingredients in a large soup pot or Dutch oven. Bring to a boil, then lower the heat and simmer, covered, until the lentils are done and the sweet potatoes are tender, about 45 minutes. Once the soup is cooked, stir in the following ingredients and cook gently for a few minutes until desired thickness is achieved. Salt will likely not be needed because of the soy sauce, but add in salt if desired. Zucchini and curry play well together. This easy soup is thickened with beans and rice. No oil and whole-food ingredients mean this soup is super-healthy and low-calorie, though it doesn’t taste like it. In a Dutch oven or other large pan, cook the following ingredients in water (start with 1/4 cup and keep adding as needed), until onion is soft and transparent and zucchini cubes are soft, 5-10 minutes. Add the following ingredients, bring the soup to a boil, then turn down, cover, and simmer for 20 minutes. Once the soup is cooked, use a hand (immersion) blender to puree soup in pan. * Pre-cooked brown rice is available in the frozen section of some stores, like Trader Joe’s. This is one of those comforting soups that helps you relax. It's not trying to impress -- it just tastes good and wholesome, and that's enough. 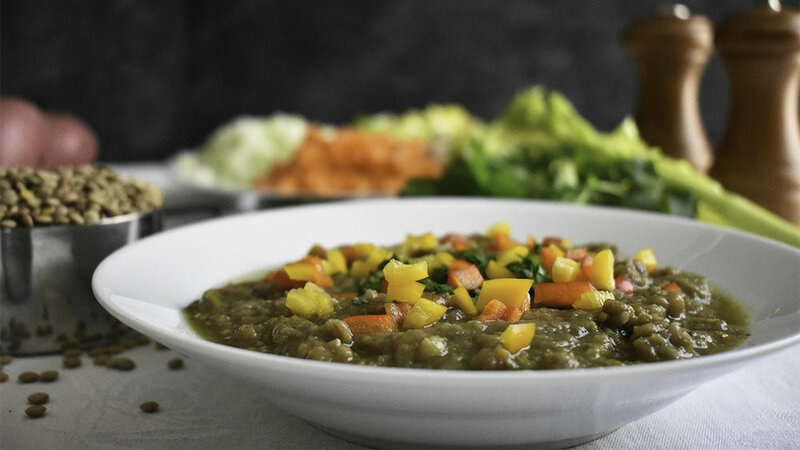 The combination of green and yellow split peas gives it a golden-green glow, and the vegetables provide welcome chunkiness and variety. Add the following ingredients to the pot and bring to a boil. Reduce heat to low and simmer, stirring occasionally, until the peas are very soft, about 1 hour. The soup will thicken as it sits after cooking. Stir in additional water as needed. If you don’t have porcini mushroom powder, use ½ ounce dried porcinis (soak them in boiling water, then chop them and add to the soup, along with the soaking liquid). With several different mushroom varieties used here, the flavor is beguiling, while the cashews take care of the creamy texture. Water-sauté the following in a soup pot or Dutch oven until the onion and celery are soft, 5 minutes or more. Add the following to the pot. Bring the soup to a boil, reduce the heat, and let it simmer 15-20 minutes, until the mushrooms are cooked through and tender. Use an immersion blender to puree the mushrooms to your desired level of chunkiness or smoothness. Separately, drain the water from the cashews (if you soaked them) and blend them in a blender with 1 ½ cups fresh water until absolutely smooth. Add the cashew cream to the soup, and stir it in. Blend the soup more, if desired. Season to taste with additional salt and vinegar or Braggs, starting with 1 teaspoon and tasting to see if you want more. Garnish with additional minced parsley if desired. A little rice goes a long way… It’s the secret to why this soup is so creamy. The texture is silky smooth, making the soup perfect for an elegant dinner party, or for whenever you want to feel elegant. Wash the asparagus. No need to snap off the hard ends. Garnishes. Cut the tops off 12 of the stalks to use as garnishes at the end. Either microwave these tops for 2-3 minutes with a little water, then cool quickly with cold water, or cook in water on the stove for about 3 minutes, then cool quickly with cold water. Broth. Cut the bottom third from each stalk and combine them with leek tops, broth, and bay leaf in a soup pot or Dutch oven. Simmer for 15 minutes. Strain, discard the solids, and save the broth. The soup. Return empty pot to the stove. Water-sauté with ¼ cup water the white parts of the leeks until they are transparent, about 5 minutes. Add the next ingredients, bring to a boil, then reduce to a simmer. Simmer, covered, for 10 minutes. Add next ingredients and simmer, covered, over low heat, until asparagus is completely tender, 7 to 10 minutes. Purée the soup with an immersion blender to desired texture. Season with these. Serve with the asparagus tops as garnish. I recommend a serrated peeler for getting the tough skin off the butternut squash. Or buy pre-peeled and cubed squash at the store. The alluring taste of this soup will make your guests think you worked all day on it. 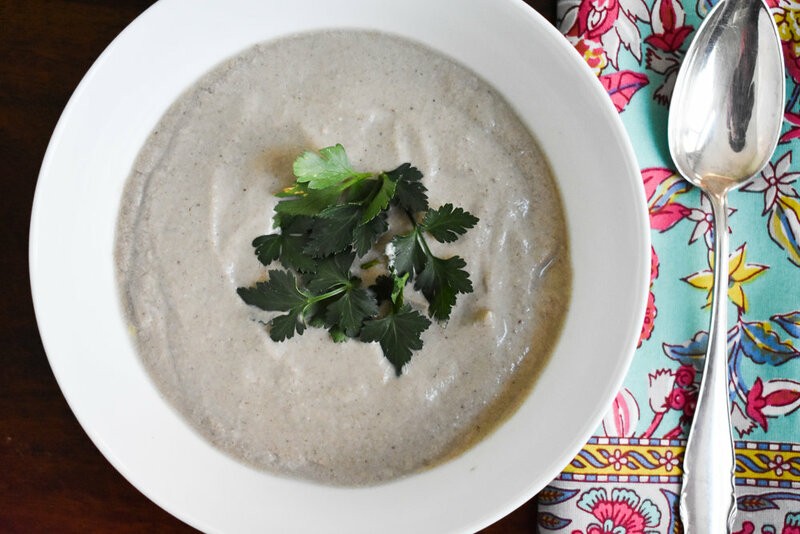 The cashews and coconut extract make the soup taste like it was made with coconut milk, but you save a lot of saturated fat by avoiding coconut milk. Drain and rinse the cashews and dates (if you soaked them) and combine with fresh water in the blender. Blend until the cashews are dissolved. Set aside. In a Dutch oven or other large pan, combine the following ingredients, increase the heat to high and bring to a boil, then decrease the heat to low and cover and simmer until the squash is tender, about 20-25 minutes. Decrease the heat to low and stir in the cashew and date mixture. Cover and simmer about 5 minutes until desired thickness is reached. Remove the cinnamon stick. Stir these in. Remove from heat. Use an immersion blender to create a very smooth soup, adding additional broth or water for a thinner consistency if you like. Or you can use a regular blender after the soup has cooled a bit. Cook over low heat just until heated through. Broccoli cheese soup is popular in restaurants for at least two reasons. Number one, it’s tasty. But it also lets you feel virtuous about eating your vegetables. This plant-based version uses nutritional yeast to get that cheesy flavor. Filling, delicious, and healthy, this soup hits the bulls-eye. Water-sauté the onion and garlic in a soup pot or Dutch oven until the onion is transparent, around 5 minutes. Add the next ingredients. Cover and bring to a boil. Once boiling, lower heat to a simmer. Cook about 10 minutes until the carrots are tender. Now, make the cashew cream by draining the cashews and placing them in a blender with these ingredients. 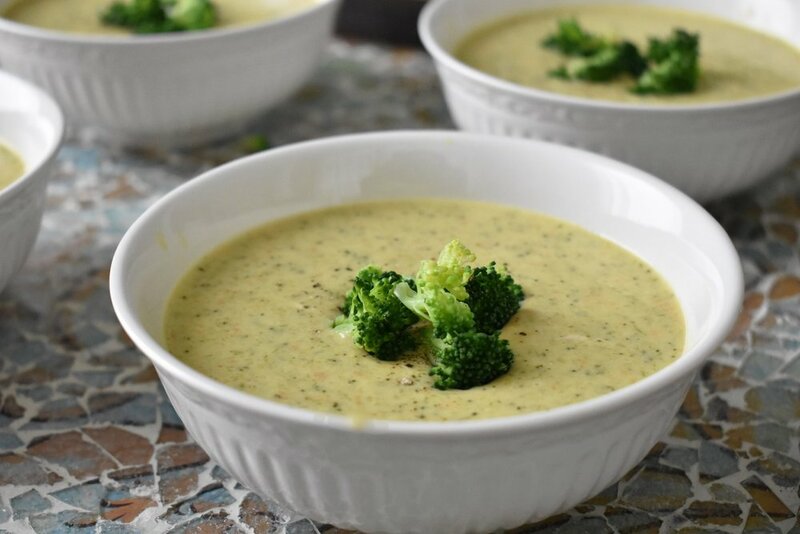 If your blender is large enough, add the vegetables and broth into the blender with the cashew mixture and puree the soup until only small chunks of broccoli and carrots are visible. Cook the soup on low heat, partially covered, for about 5 minutes, until thickened, stirring occasionally so that it doesn’t burn on the bottom. Someone told me recently about how good the Trader Joe's Organic Tomato and Roasted Red Pepper Soup was. This person was a vegan, so I bought the soup without reading the ingredients. After trying it and liking it, I read the carton and saw there was milk in it. So I got out my blender and my cashews and experimented a few times. This result is super easy and tastes amazing! You can also add things to it -- cooked kale or other vegetables, also grated tempeh or other protein. It's a wonderful base for a creative lunch. Place them in a blender with water. Blend for 30 second to several minutes, depending on your blender, until the cashews are completely dissolved. Put soup in a Dutch oven, bring to a boil, lower and simmer for about 5 minutes until thickened. 1 can of chickpeas or, if you have more time, try 8 ounces tempeh, grated, boiled uncovered in 3/4 cup water, 1-2 Tablespoons soy sauce until water and soy sauce are absorbed, about 5 minutes. Link to Creamy White Bean Soup recipe. GV comments: When I first saw this recipe, I thought only that it looked healthy. But then I made it. The spicing, especially the smoked paprika, creates a flavor with a difference. I admit that my first thought was, "Hey, this tastes like Campbell's Bean with Bacon soup from when I was a kid!" (We called it "Bean'acon soup.") But this is way better. It's all whole-food, unprocessed ingredients and it can be frozen. A real keeper. This soup is based on a non-vegan recipe found by my friend Teresa, found on Hispanic Kitchen's site. The soup is basically a comforting noodle soup, but the chile, cumin, and smoked paprika make this stand out against blander versions of noodle soup. I haven't had a cold since I went vegan, but if I ever do again, I'm going to make this soup. My hard-to-please husband also liked this soup a lot. Take your peas and carrots out of the freezer and let them defrost slightly while you prep your ingredients. In a Dutch oven or other large soup pan, heat olive oil to medium hot. Add the fideo and cook until the pasta starts to toast in some spots. Turn as needed. After a few minutes, add the onions, garlic and serrano, stir well and cook for 2 minutes. Add the remaining ingredients. Only add 2½ cups of broth to start, and reserve the other ½ cup. Bring to a boil. Reduce heat, cover and cook until most of the broth is reduced. If you need to, you can add the remaining ½ cup of broth at this time. Add the peas and carrots, cover, and continue cooking for another 3 to 5 minutes. Serve. If you want this more like a risotto, remove from heat and let stand for 10 to 15 minutes; the broth will be absorbed as the pasta sits. Nutrition: The two processed ingredients are the 2 teaspoons oil and the fideo. This soup gets rave reviews by everyone who's tasted it. Based on a recipe by the great Tal Ronnen, this adaptation leaves out the chipotle chiles, bumps up the role of potatoes, and uses a quick-soak method for cashew cream. The result is divine. Nothing is lost to a heavy-cream version. This will be your new go-to creamy soup. Soak cashews in cold water at least 2 hours, or pour boiling water over them, cover, and let them soak 20 minutes. While the soup is cooking, complete the cashew cream by draining the cashews and rinsing them under cold water. Then place them in a blender with enough fresh cold water to barely cover them. Blend on high for several minutes until very smooth, so smooth that you can no longer detect any bits of cashews—they’ve dissolved. After the potatoes are soft, mash some of the potatoes in the soup pot with a potato masher and stir to thicken the soup. Add the final ingredients and simmer for 4-5 minutes, stirring often, because it tends to burn on the bottom of the pot.